WIN a Michael Kors Watch for Valentine’s Day! Here at WatchesOnNet, our love for watches is only trumped by our love for our Facebook fans and followers. So this year for Valentine’s we are gifting you a chance to WIN a Michael Kors watch for yourself or the special lady or gent in your life. Head over to our Facebook page, become a fan if you aren’t already, and share the post on your page. Whoever gets the most likes on their repost by midnight EST on Thursday, February 14th will get a little (new watch) action! Posted on January 31, 2013 October 29, 2014 Author Luxury Watch ReporterCategories Fashion Watches, Michael Kors, NewsLeave a comment on WIN a Michael Kors Watch for Valentine’s Day! Girls obsession with Michael Kors is based on a chic watch formula factor – one that Michael Kors has factored and solved – he knows what a Lola (i.e. girl) wants in a watch! Michael Kors in essence knows “Lola” and as the lyrics of song points out, “Whatever Lola wants, Lola gets,” and Michael Kors not only gets what Lola wants he continues to deliver it with stately high-end fashioned watches that woos all the Lolas. If you aren’t familiar with Michael Kors women watches, you may want to take a peek at these captivating beauties, however, look at your own risk as it is not unusual for many women to succumb to the urge to purchase multiple Michael Kors watches. Mid-Size Luggage Leather Golden Stainless Steel Peyton Chronograph watch (Style No. MK2261) attracts with its 38 mm case, golden round bezel and luggage leather band. It features golden mother-of-pearl chronograph with tonal time stops, date window, stop watch function and is water-resistant up to 10 ATM. Oversized Madison Chronograph Glitz watch (Style No. MK5598) woos with its distinctive white horn acetate 45 mm case and bracelet, clear pave crystal insets on silver-tone round bezel. It displays white chronograph dial with silver-tone time stops and accents along with date window. It has a stop watch function and is water-resistant up to 5 ATM. Oversized Rose Golden Stainless Steel Runway Three-Hand Glitz watch (Style No. MK5661) is big sporting a 45 mm case in rose golden stainless steel. 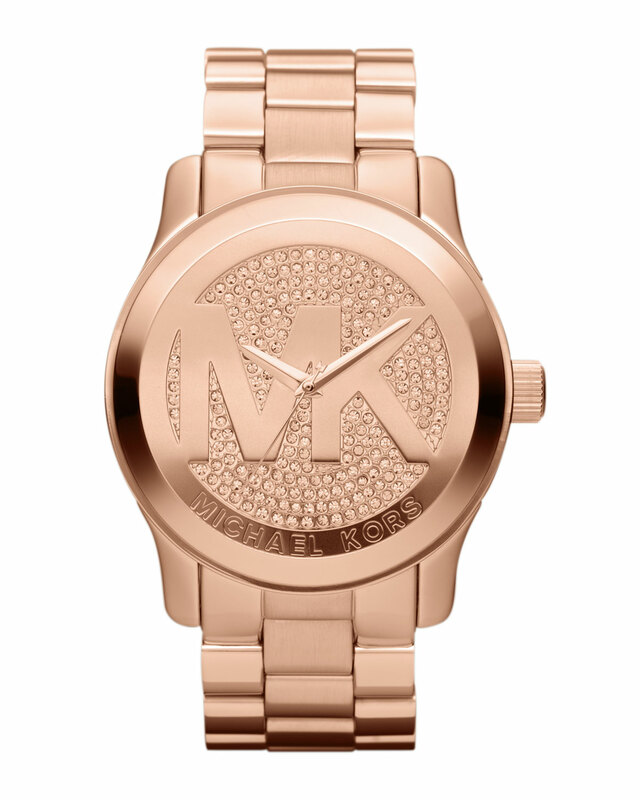 It has three-hand movement and its dial is generously encrusted with pave rose golden glass crystals donning MK logo on the dial. It is water-resistant up to 10 ATM. Mid-Size Black Stainless Steel Layton Chronograph Glitz watch (Style No. MK5668) strikes a dramatic cord with its rich black stainless steel 43.5 mm case, three-hand movement, clear glass crystals saturated dial and silver color dial with tonal accents. It is water-resistant up to 10 ATM. All of these watches are imported and merely a few of the elegant watches Michael Kors is wooing obsessive Lolas, okay girls with. 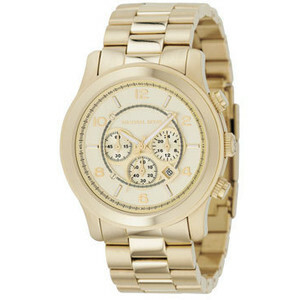 One thing is certain if you’re a girl Michael Kors has a watch that is sure to woo you. 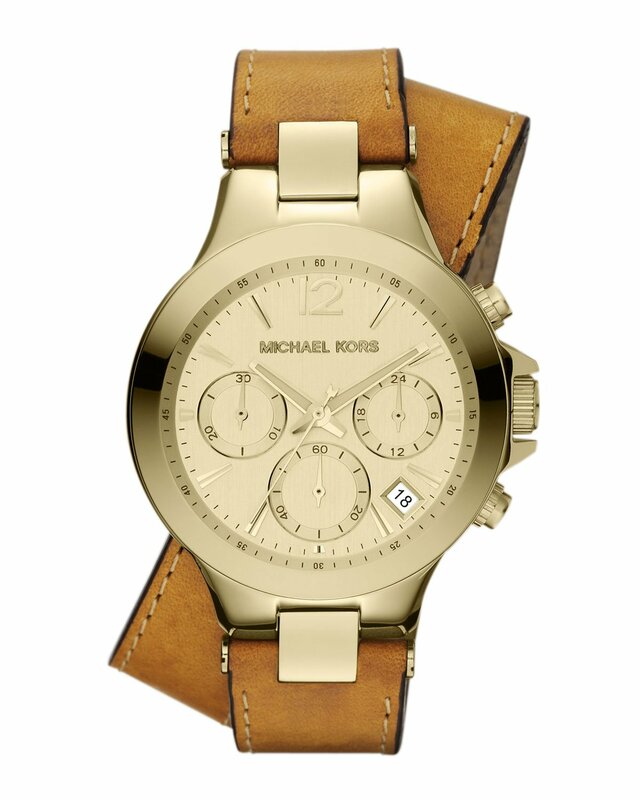 Checkout our entire collection of Michael Kors Watches Here! With the economy’s head barely above water, it’s tough to make it in the high-end fashion industry these days. However, one man seems to be keeping his head well above the water: Michael Kors. Michael Kors has truly transformed as a designer to meet the changing needs of his customers. Even though he is considered a part of the “high end” fashion industry, Kors keeps his product and prices ever changing to meet the needs of his clientele. Michael Kors designs are flying off the shelves and, one of his most popular items, men’s and women’s watches are flying even faster. They are considered some of his more “affordable” accessories; his various types of chronograph watches. A Michael Kors’ Runway Watch. In this year is the Michael Kors’ watch that everyone is dying to have. It is sleek and fine tuned, with flesh colored links and a smaller face. This particular watch can be seen on celebrities such as Ashley Benson and Dakota Fanning. Some of his other designs are various colors and sizes, some having actual numbers on the face while others having merely notches to indicate time. 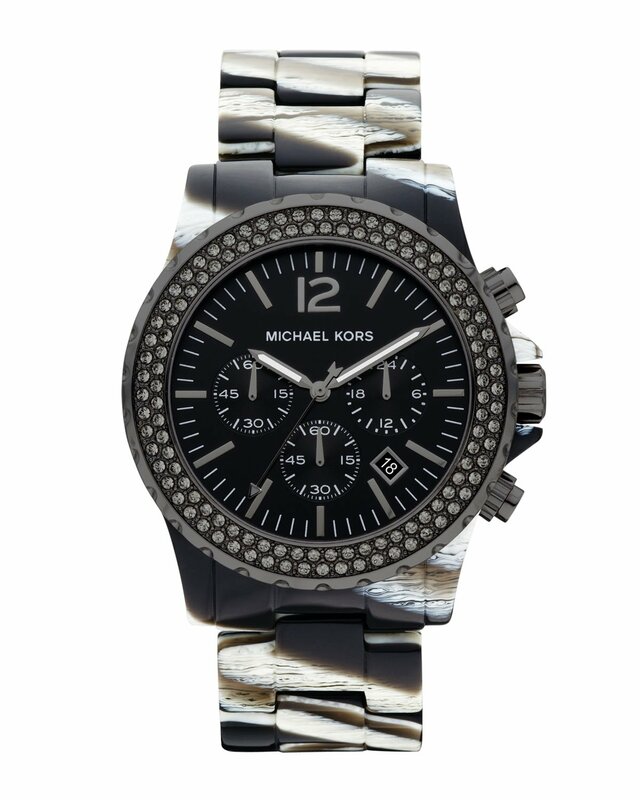 All in all, the Michael Kors watch screams high class and does not undermine fashion what so ever. Also in this season, are Michael Kors’ Tortoise Shell watches. Whether the design lines the face, is actually behind the face, or on the band, these watches are flying off the ledge. 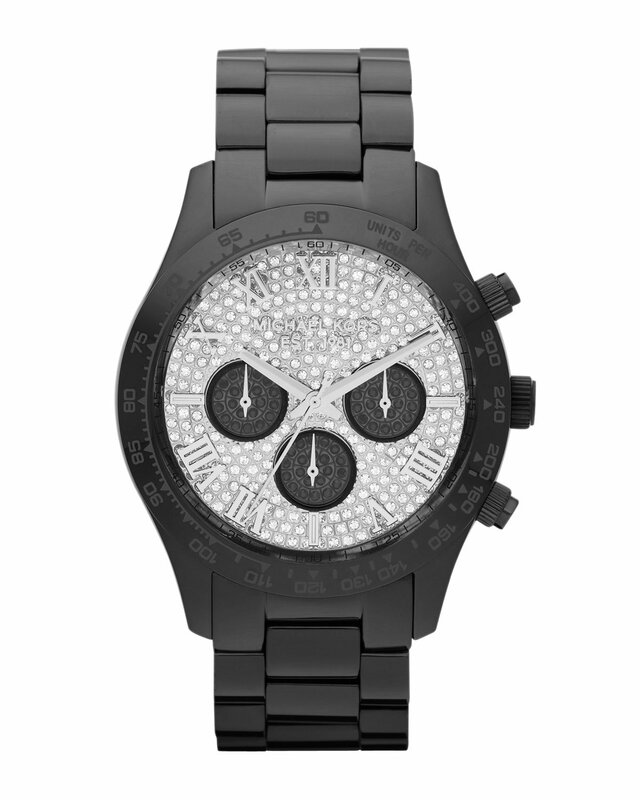 Another one of Kors’ popular watches is the “Runway Watch” which comes in a variety of colors. These watches are monochromatic, or basically all one color. Not only are they interesting on the eye, but are a fashion steal at $250.00. Also widely popular are Kors’ chronograph watches. One line in particular are rectangular in shape, with three chronographs on the inside of the face. They are also priced at $250.00. Consumers want reasonably priced luxury. Most top-end brands don’t discount their merchandise: never having sales let alone clearance items. Kors just gets it. A huge success of the brand is due to the launch of MICHAEL, a Kors collection of lower-priced apparel and accessories like watches and fragrances. With this brand, middle class folk are able to afford high-class stuff. And that’s something nobody is going to turn down. Whether it is clothing, fragrances, handbags, shoes, and accessories for the iPhone and iPod, Kors’ products are flying off the shelves. From what I can see, the designer has a winning retail method: and it all started with his watches.